Nath Udyog firmly positioned ourselves as a leading Manufacturer of Composite Container In Bangladesh . These Paper Composite Containers are finds its application in various packaging applications in Food, Chemical and Pharmaceutical Industries for increase the storage life of the products.Packaging Container is manufactured using superior quality raw material and widely used in various industries for packing purpose and highly appreciated by our esteemed clients for its high efficiency, long lasting durability and perfect results. Made from high quality material, these Long tin container are used in tea and coffee industries for packaging.Paper Tube Container With the help of our skilled and experienced professionals, we are recognized as one of the most prominent manufacturers and exporters of Paper Tube Container. Our clients can avail from us a wide range of tube containers which is manufactured by experienced personnel employing high grade materials and most modern technology.Our organization is widely preferred in manufacturing and supplying a superior quality range of Paper Composite Containers in Noida, Uttar Pradesh, India. Our offered Paper Composite Containers are designed and made by making use of top grade raw material incorporating high-end Indian Technology. 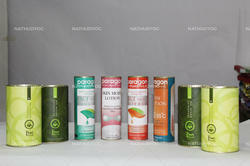 Our firm offers a high-quality range of Round Composite Paper Cans. It is manufactured using top quality materials and latest technology and tested under various quality parameters. Looking for Composite Container Manufacturer In Bangladesh ?